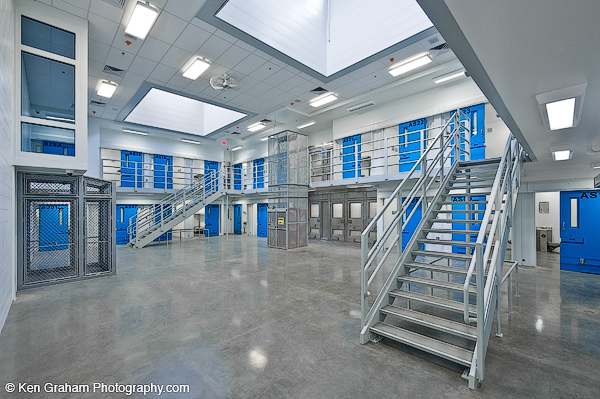 Snoqualmie, Wash., July 23, 2018 – Technical Glass Products (TGP), a brand of Allegion, and The LTI Group announced the availability of a new, high-performance fire-rated glass and security solution for detention centers—Pilkington Pyrostop® laminated to Smartgard Glass®. The transparent wall panel is fire-rated for up to 120 minutes and offers attack and containment ratings up to 60 minutes in compliant fire-rated and attack-rated doors and frames. For enhanced safety, it is available with up to Level III bullet-resistance ratings. The combined Pilkington Pyrostop and Smartgard Glass glazing assembly is classified and labeled with Underwriters Laboratories, Inc.® (UL) for doors, windows, sidelites and transoms. It is available for interior and exterior use. Pilkington Pyrostop is a fire-rated and impact safety-rated glazing material that blocks radiant heat, helping protect people and valuables on the non-fire side of the glass where heat transfer might be a concern. The Smartgard Glass product line is designed to meet today’s security needs for ballistic, containment, blast, and signals defense. A brand of Allegion, TGP is your one source for fire-rated glass and framing systems, along with specialty architectural glass products. For more information on Pilkington Pyrostop laminated to Smartgard Glass, along with TGP’s other fire-rated framing and glass products, visit www.fireglass.com or call (800) 426-0279. The LTI Group (LTI) is leading providers of innovative laminated glass and polymer products to a broad variety of industries, such as architectural, automotive, airline, marine, entertainment, security and industrial – among others – around the world. For more information about LTI’s products and services, call (413) 637-5001 or visit www.ltisg.com.